The Hamilton Beach Flexbrew is a dual capability automatic drip coffee maker that allows the user to brew anything from a full 12-cup carafe down to a single cup. The machine has two separate dispensers. One offers a hot plate, carafe and multi-cup functionality, while the other allows for single cup brewing (including directly into a travel mug or thermos). It can also dispense hot water for making tea or hot chocolate. In addition to using ground coffee, the Flexbrew is compatible with K-Cups. The unit is programmable and offers options for brewing regular or bold strength coffee. Overall, this is a versatile, low-priced, good coffee maker that offers users a range of brewing options. However, third party reviews have raised several issues that may be a ‘deal breaker’ for some potential buyers. Please note that while the Flexbrew advertises its ability to brew up to 14oz from ground coffee directly into a travel mug, it is not sold with the actual travel mug! The first thing to note about the FlexBrew is the nice, compact design. This is a coffee machine that packs a lot of functionality into a relatively small unit. This makes it an attractive option for anyone with limited counter or desk space. The second thing to note is the neat ‘dual aspect’ of the FlexBrew. One side has a hot plate and traditional-style glass carafe, while the other offers single-cup functionality. There’s a simple dial to switch between the two, but you can only brew on one side at a time. Additional features include an option to program the multi-cup side by dialing in the time in hours and minutes when you want the brewing to start. The multi-cup side is fitted with a brew basket and permanent gold filter. You can use paper filters and ground coffee to brew up to 12 cups into the carafe, at either regular or bold strength. The single-cup side features an adjustable cup rest, so you can brew directly into a cup, mug or travel thermos. On this side, there is a pull-out drawer into which you can add ground coffee. One of the big advantages of the newer model of the FlexBrew (49983A) is that it is also compatible with those love ‘em or hate ‘em K-Cups. A separate plastic insert is provided, which you place inside the drawer to accommodate the ‘pod’. For anyone looking for a simple way to get started with this type of brewing without making a huge investment in a Keurig machine, the FlexBrew might be a good way to go. In fact, given all of this versatility, the FlexBrew has appeal for a range of coffee lovers. It could especially suit office workers wanting to get away from vending machine or instant coffee. The FlexBrew would also suit home brewers looking for a first, replacement or back-up machine. However, it’s not all plain sailing with the FlexBrew. There are issues that seem to crop up repeatedly with some users. One of these concerns the fact the hot plate heats up even when exclusively brewing on the single-cup side. This isn’t a huge deal, but it does throw up some safety issues. Also, if you overfill the FlexBrew, you may get an annoying ‘ERR’ (i.e. error) message that halts the brewing process. For capsules, the maximum water level is 10oz and for brewing with grounds (on the single-serve side), the water level should not exceed 14oz. However, the overriding issue that seems the most problematic is the plastic, chemical taste that a number of users have reported. While a touch of ‘new machine’ residue is normal, there are reports of a strong taste and smell lingering, even after several cleaning cycles. Hamilton Beach has acknowledged this can be a problem on some (but by no means all) its units. Using a baking soda solution to clean the out the machine is one of the recommended remedies. Maintenance-wise, the Flexbrew doesn’t require too much attention. The removable parts can be cleaned in hot soapy water (they are also dishwasher safe). Internal cleaning requires running a mixture of vinegar and water through the brew cycle a few times before flushing the machine out with plain water. Given the dual aspect of the FlexBrew, this is time-consuming but otherwise hassle-free. Other maintenance duties include cleaning out the piercing nozzle (used to pierce K-Cups) by poking out any lodged coffee grounds with the tip of a paper clip and running some water through to make sure the nozzle is clear. The manufacturer recommends cleaning the FlexBrew minimally on a monthly basis (weekly if you live in a hard water area). Given the issues with the residual plastic taste/smell, it is especially important to clean out the machine before the first use. If in doubt, refer to the handbook or contact the manufacturer for advice. There’s much to like about the FlexBrew, which makes it particularly frustrating that it comes with so many negative reports. While it’s easy to dismiss the occasional gripe, the FlexBrew has (to date) around a third of its nearly 3,000 Amazon user reviewers ranking it at either one or two stars. To be fair to the FlexBrew, there are plenty of customers who simply love this machine, with over a third of third-party Amazon reviewers ranking it a full five out of five. Not surprisingly, most of these reviewers mostly enjoy the flexibility of being able to single and multi-cups of coffee. So what to make of a machine with such polarized feedback? Well, it’s probably best to say that if you’re in the market for a versatile drip coffee maker for less than $100, the FlexBrew should definitely be on your list of possible options. By all means, weigh up the pros and cons, but don’t be put off of the FlewBrew based on its reviews alone. After all, there are plenty of purchasers who have found their lives have been much improved because they invested in the FlewBrew. 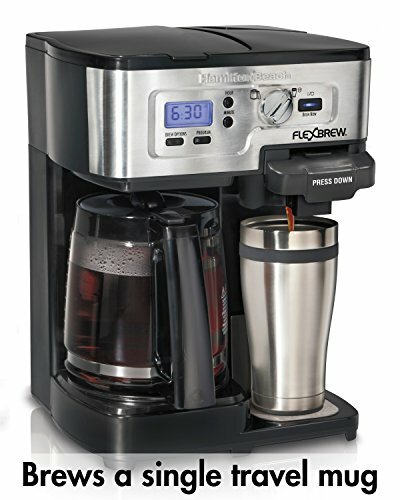 Pros: The FlexBrew is certainly versatile, providing a single coffee brewing solution for the home or office. It offers a lot of features for a relatively low price and has the added advantage of being K-Cup compatible. This is a compact coffee machine that will not take up too much space on a desk or countertop. Maintenance is pretty straightforward. Cons: Users report a number of issues which may make the FlexBrew a slightly less attractive option. These include a strong plastic smell and taste that supposedly linger even after cleaning (something acknowledged by the manufacturer to be a problem on some 49983 model units). Other issues include the fact the hot plate heats up when using the single-serve side and the appearance of the ERR message when water levels are only slightly off. Some people have also commented on the design of the carafe, which has led to some breakages. In a sentence? On the face of it, the FlexBrew is the answer to many home coffee lovers’ prayers; a relatively cheap automatic drip brewer that offers multi-cup or single cup functionality and is compatible with those beloved K-Cups…but is it too good to be true? (Some users certainly think so).